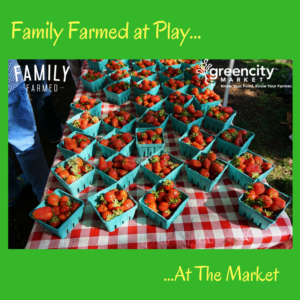 So in the spirit of giving the people what they want, we present “Bob Goes To The Farmers Market,” the premiere of our FamilyFarmed At Play video series. I used my previously unused set design skills to present my haul from Chicago’s Green City Market today (Saturday, May 27, 2017), featuring the first truly local strawberries I’ve purchased this year. Asparagus, rhubarb, radishes, buttermilk, corn meal, honey, tofu and preserves make cameo appearances in this 1 minute and 13 second epic. Minutes of planning when into the production of this video, so it’s not going to be the slickest thing you have ever watched. There is a little shaky camera work (tripod next time maybe) and the totally ad-libbed audio could be smoother. But hey, it’s a little clip to let you know what’s at the local markets here in Chicago, it’s not Lord of the Rings: Return of The Rhubarb. Hopefully you’ll enjoy it and find it informative, get hungry for more local and sustainable food — and maybe submit your own videos about your own farmers market hauls? One can only hope. And we’d like to thank Green City Market, Mick Klug Farm, Green Acres Farm, 1871 Dairy, Three Sisters Garden, Ellis Family Farms, and Phoenix Bean Tofu (a graduate of FamilyFarmed’s Good Food Accelerator), without whom this video truly could not have been made. This entry was posted in Direct Farm Marketing, Family Farms, FamilyFarmed At Play, Farm businesses, Farmers markets, Food and community, Food Entrepreneurs, Good Food Business Accelerator, Local Food, Organic farming and tagged 1871 Dairy, Ellis Family Farms, FamilyFarmed, FamilyFarmed at Play, Good Food Accelerator, Green Acres Farm Indiana, Green City Market, Mick Klug Farms, Phoenix Bean tofu, Three Sisters Garden. Bookmark the permalink.